On this episode you’re going to meet the inspiring Beerhorst family headed up by Rick and Brenda Beerhorst, the artist parents of six creative kids ranging in age from 5 to 17. Rick is an oil panter. Brenda is a fiber artist. And the kids, well, they’re all artistic, too. 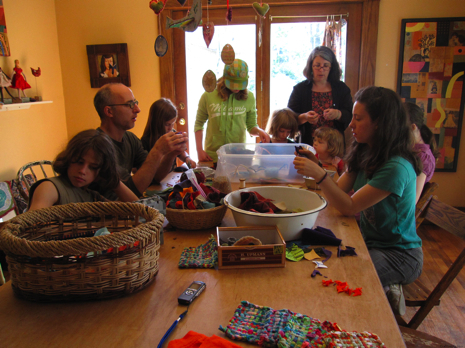 The Beerhorsts spend their days making art to sell in a creative house in Grand Rapids, Michigan where Rick and Brenda “unschool” their children, opting to educate them at home and include them in the family art business. The Beerhorsts do most things together as a family including foraging for fruits and berries growing around the city and taking their art and crafts to the weekly art market located a short walk from their home. The Beerhorsts make their sole income off their art. They traded their car for a dining room table and turned the entire backyard into a small farm complete with chickens. They don’t compromise when it comes to living off their art. They’re artists. It’s what they do. 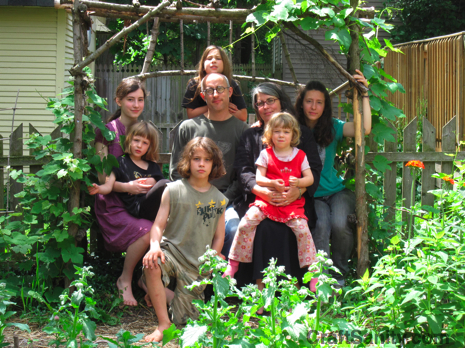 Tune in to hear how this family lives a rich and authentic life without a TV or 2.5 cars. Their story has the power to challenge and inspire the way you live. Read my story on the Beerhorst family and my column about Rose and Pearl their friend Rose. Rick also is competing in the $449,000 ArtPrize contest in Grand Rapids. Here’s his project. Rina Ward of Nostalgems is giving away this cameo pendant kit to 10 lucky CraftSanity listeners! To enter, visit Nostalgems’ Facebook page and add yourself as a fan and leave a comment on what you think about this pendant kit. Rina will randomly choose 10 entrants. Deadline to enter is August 28. Please also check out Nostalgems’ etsy shop and homepage.